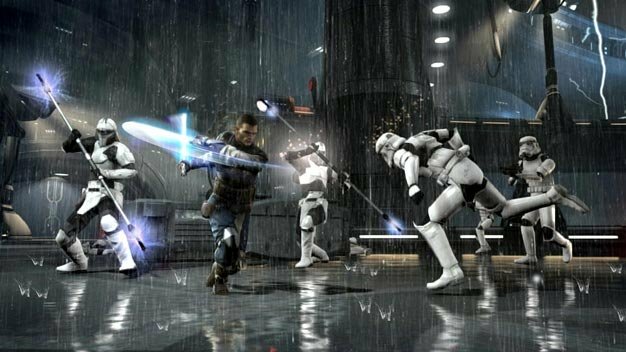 The original Star Wars: The Force Unleashed had two cool DLC missions that covered “What if” scenarios where an evil Starkiller was dropped into the events of A New Hope and The Empire Strikes Back. LucasArts never got around to showing us a Return of the Jedi-themed level, so they’re bringing it to us with Star Wars: The Force Unleashed II. This bonus mission takes place on Endor with a dark side version of Starkiller. Before we go any further; yes, you can kill Ewoks. It’s an ‘infinite universe’ scenario, meaning that it’s not in canon with the events of the rest of the game. Also, you can kill Ewoks. The developer also confirmed that this level will be about as long as the first game’s add-ons and grants Starkiller all his powers. Plus there’s an opportunity to kill lots of Ewoks. The pack comes out later in the year but there’s no word on price just yet. We’ve heard that LucasArts have an ace up their sleeve which will get it to sell loads. That ace is the ability to kill Ewoks.